Rec Royale pits 16 players against one another in a national park. There are a handful of social VR games that give gamers a chance to interact and play a host of mini-games with friends or strangers and Against Gravity's Rec Room is one of the premier ones. Paintball, charades, and other experiences are already part of Rec Room's bundle of fun, but a new one is on the way: Battle Royale. 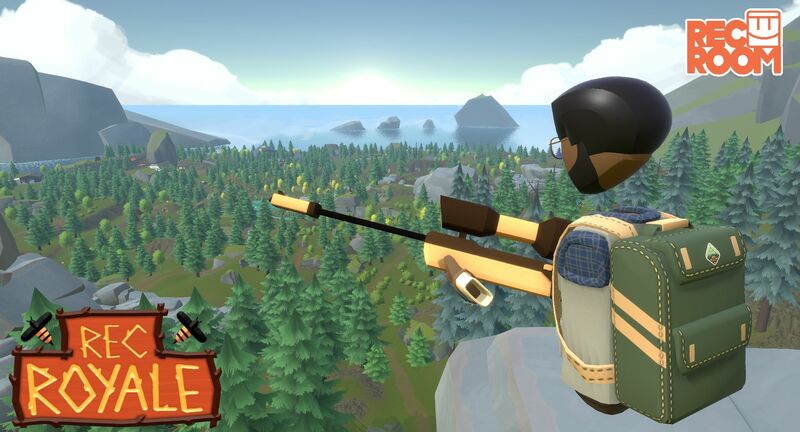 On June 7, 2018, Rec Royale will have 16 players fighting to survive in the wilds of a national park. In the PlayStation blog post, Against Gravity's community designer Shawn Whiting recognizes the many players that have been using Rec Room's custom room, maker pen, and sandbox machine mechanics to create experiences inspired by the battle royale game mode. "These player-created rooms, along with persistent community feedback, gave us a clear signal that players were hungry for something like Rec Royale," he says. 16 players will maneuver through and around camps, mountains, forests, outposts, ravines, and lakes as they seek out loot. A new backpack system has been added, allowing for quick swapping and storing of weapons and power-ups. PlayStation Plus users will receive an exclusive paintball burst rifle skin, but the game doesn't require a subscription. It's also cross-platform and free. Rec Royale will go live on June 7, but a public alpha test will take place from May 25 to May 27. The mode will launch with solos, but Whiting added that support for squads and other modifiers are being researched. Rec Room is available for free on HTC Vive, Oculus Rift, and PSVR. Stay tuned to Shacknews for more updates. Ok, now THAT is a Battle Royale mode I could get excited about!